How are the emerging power players of Brazil, India and China reshaping the global order within the G20? GUESTS: Alan Alexandroff is co-director of the G20 Research Group at the Munk School for Global Affairs at the University of Toronto. Gordon Chang is a columnist at Forbes.com. He is author of The Coming Collapse of China (2001). Visit gordonchang.com. Jorge Heine is chair of Global Governance at Wilfrid Laurier University and a distinguished fellow at the Centre for International Governance Innovation. He was previously Ambassador of Chile to India, Bangladesh and Sri Lanka (2003-2007), and Ambassador to South Africa (1994-1999) as well as a Cabinet Minister and Deputy Minister in the Chilean Government. Ananya Mukherjee Reed is an associate professor in the Department of Political Science and Social and Political Thought, and director of the International Secretariat for Human Development at York University. She is the author of Human Development and Social Power: Perspectives from South Asia. Seth Pinsky, President, NYC Economic Development Corporation (Mar 26, 2009 at Columbia University, School of International and Public Affairs (SIPA)) Pinsky presents an overview of NYCEDC and the City’s economic development agenda, highlighting specific projects for the future and the increased focus on diversification initiatives in light of the current financial downturn. The event was co-sponsored by SIPA’s Urban Policy concentration and the Graduate School of Architecture, Planning and Preservation. In the search for India’s prosperity and energy independence, important figures such as Carlos Gutierrez, US Secretary of Commerce, Minister Sushil Kumar Shinde, Ronen Sen and William S. Cohen among others gathered at the Green India Summit to make the US and India equal partners in sustainable development. 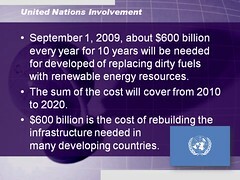 Bali – the UN Conference and its Impact on International Climate Change Policy – Select Committee on Energy Independence and Global Warming – 2007-12-19 – Chairman Edward J. Markey (D-Mass.) of the Select Committee on Energy Independence and Global Warming held a hearing on the post Bali, Indonesia international climate negotiations. Chairman Markey and other members of the Select Committee hosted climate experts returning from Bali to discuss the outcome of the climate conference and an effective path forward on global warming for the United States and the international community. WITNESS LIST: * Ms. Christiana Figueres, Official Negotiator, UN Framework Convention on Climate Change and the Kyoto Protocol, Costa Rica; * Mr. Philip Clapp, Deputy Managing Director, Pew Environment Group; * Mr. Alden Meyer, Director of Strategy and Policy, Union of Concerned Scientists; * Mr. Ned Helme, President, Center for Clean Air Policy; * Mr. Myron Ebell, Director, Energy and Global Warming Policy, Competitive Enterprise Institute. Video provided by the US House of Representatives. Agriculture sector, world over, has experienced a phenomenal growth since the mid-twentieth century. The growth, driven by Green Revolution technology, has made a significant dent on aggregate supply of food grains, ensuring food security to the growing population. The next stage of agricultural growth however, faces a serious challenge in terms of sustainability. Whereas the main problem faced by the developing countries in the south pertains to sustainability of resource use, the main challenge facing the developed economies in the north is overuse of chemical inputs. These problems have led to increasing awareness and a felt need for moving away from the input intensive agriculture perused during the Green revolution phase, to sustainable farming in different parts of the world. While the need for a paradigmatic shift in the growth strategy is well recognized, the transition from input intensive to sustainable farming however, has certain inherent difficulties. Notwithstanding these limitations, policies in both the north as well as the south have led increased emphasis on promoting sustainable agriculture. India can safely be characterized as an agricultural country despite the recent spurt in manufacturing and services and the declining share of agriculture in the national income, since majority of its workforce (~ 65%) are still engaged in agriculture and allied activities. It has been the noblest profession in India since the time immemorial and has been carried out on sustainable basis. It is only relatively recent phenomenon that large-scale forest areas, grazing lands and waste lands have been converted into croplands to support the rising population, which has caused ecological imbalance and atmospheric pollution. With no further scope for expansion of agricultural land efforts have been made to enhance the production of food grains using high-yielding variety of seeds, fertilizers and irrigation along with advanced farm equipments. However, so-called green revolution is cofined to a few crops, viz, wheat, rice and maize and has been possible only in restricted areas, i.e., Punjab, Haryana and Western Uttar Pradesh and certain selected districts of Andhra Pradesh, Maharashtra and Tamilnadu. Naturally much work is needed to lift the agriculture to a level where it is least affected by vagaries of monsoon and needs little from outside the farm, i.e., lesser dependence on chemical fertilizers and water. The limited success of green revolution has been a mixed bag in that it has given rise to new set of problems: overuse of water and fertilizers. Excessive use of water results in water logging and salinization whereas excess of fertilizers and pesticide cause pollution of water bodies contamination of ground water. India has the largest area of irrigated land (55 million hectares) of which about one-third land is already degraded and 7 million hectare have been abandoned1. In such a situation a renewable and lasting alternative, sustainable agriculture, has to emerge for successful agricultural revolution. In the present paper the need for sustainable agriculture has been emphasized. Policies for sustainable agriculture and organic farming and possible actions in India are discussed. We can compare three broad types of farming: traditional production systems, conventional modern agriculture (such as Green Revolution technologies), and sustainable agriculture. We can compare them across three dimensions: ecological, economic and social. Soil fertility: A continuous fall in soil fertility is a major problem in many parts of India. Sustainable agriculture improves fertility and soil structure and prevents erosion, so would be an answer to this problem. Water: Irrigation is the biggest consumer of fresh water, and fertilizer and pesticides contaminate both surface- and groundwater. Sustainable agriculture increases the organic matter content of the topsoil, so raising its ability to retain and store water that falls as rain. Biodiversity: Sustainable agricultural practices frequently involve mixed cropping, so increasing the diversity of crops produced and raising the diversity of insects and other animals and plants in and around fields. Pollution: Pesticides are hazardous to human health as well as to the local ecology. Incorrect handling, storage and use of pesticides lead to health and pollution problems. Sustainable agriculture reduces or eliminates the use of hazardous chemicals; instead it controls pests with a variety of biological and agronomic measures and the use of natural substances. Landscape: Agriculture and forestry clothe the rural landscape. Inappropriate use causes erosion, landslides and flooding, clogs irrigation channels, and reduces the ability of the land to support the local population. Impoverished rural people flock into the cities in search of jobs, forming unsightly, insanitary slums that further destroy the landscape. Rehabilitating ecologically damaged areas needs huge investments that few countries can afford. Sustainable agriculture avoids these problems by improving productivity, conserving the soil, avoiding the expansion of farming into unsuitable areas, and preserving rural jobs. Climate: The way agriculture is practiced contributes significantly to global climatic changes. Conventional agriculture contributes to the production of greenhouse gases in various ways: by reducing the amount of carbon stored in the soil and in vegetation, through the production of methane in irrigated fields, and through energy-intensive activities such as the production of artificial fertilizers. Adopting sustainable agriculture would reduce these impacts significantly. Agriculture cannot be sustainable unless it is economically viable over the long term. Conventional agriculture poses greater long-term economic risks than “sustainable” alternatives. Export vs. local orientation: Governments tend to view export-oriented production systems as more important than those that supply domestic demands. This is misguided. Focusing on exports alone involves hidden costs: in transport, in assuring local food security, etc. Policies should treat domestic demand and in particular food security (either by farmers producing food for themselves, or by selling produce for cash they can use to buy food) as equally important to the visible trade balance. Debt: The Green Revolution raised India’s grain output significantly, but a vast number of small-scale farmers ran into a debt trap: they took out loans to raise their production, and then found they could not pay the money back. About 40,000 were so desperate that they committed suicide. Risk: Concentrating on specific commodities seems to promise high economic returns. But market production implies certain risks: markets change quickly, and international agricultural prices are dropping. Cheap foreign food may sweep into the national market, leaving Indian farmers without a market. As a World Trade Organization signatory, the Indian government is under pressure to deregulate and open its economy to the world market so cannot protect its farmers behind tariff walls. Niche markets: Organic agriculture is one of the strongest ways to farm in an environmentally sustainable way. The demand for certified organic products is increasing quickly, opening opportunities to expand sales of such products and to explore niche markets. Employment: Farming is the main source of employment for rural people. Trends towards specialization and mechanization may increase narrowly measured “efficiency”, but they reduce employment on the land. The welfare costs of unemployment must be taken into account when designing national agricultural support programmes. Sustainable agriculture, with its emphasis on small-scale, labour-intensive activities, helps overcome these problems. The social sustainability of farming techniques is related to the ideas of social acceptability and justice. Inclusiveness: Development cannot be sustainable unless it reduces poverty for the broad masses of people in India. The government must find ways to enable the rural poor to benefit from agricultural development. Political unrest: Gaps between the “haves” and “have-nots” feed a feeling of social injustice among those who feel neglected and excluded from development opportunities, as well as from better-off sympathizers. The result is a climate favorable to political opposition and even violence. Local acceptance: Many new technologies fail because they are based on practices or assumptions from outside. Sustainable agricultural practices usually are based on local social customs, traditions, norms and taboos, so local people are more likely to accept them and adapt them to their own needs. Indigenous knowledge: Sustainable agricultural practices often rely on traditional knowhow and local innovation. Local people have a wealth of knowledge about their environment, crops and livestock. They keep locally adapted breeds and crop varieties. They have social structures that manage and conserve common resources, help people in need, and maintain the social fabric. Rather than ignoring or replacing this knowledge, sustainable agricultural development seeks to build on it and enrich it with appropriate information from outside. Gender: In traditional agriculture, women traditionally bear the heaviest burdens in terms of labour. In modern conventional farming, too, men often benefit the most: they control what is grown and how the resulting income is spent. Sustainable agriculture attempts to ensure that the burdens and benefits are shared more equitably between men and women. Food security: Traditional farming techniques often fail to produce enough food, or enough variety of food for a balanced diet. Conventional modern farming focuses on a few commodities, so people still do not have a balanced diet. Sustainable agriculture improves food security by improving the quality and nutritional value of the food, and by producing a bigger range of produce throughout the year. Participation: Traditional society in India is raven by wealth and caste distinctions. Introducing conventional farming innovations tends to exacerbate these: the rich and higher-caste tend to benefit, while the poor and lower-caste are left out. Sustainable agricultural interventions consciously target the less well-off, and empower them so they can organize and speak with their own “voice”, so promoting dialogue and democracy. The sustainable agriculture may be defined as any set of agronomic practices that are economically viable, environmentally safe, and socially acceptable. If a cropping system requires large inputs of fertilizer that leak from the system to pollute ground water, drinking supplies and distant coastal fisheries, the system may be sustainable economically as the long-term supply of fertilizer is stable and the economic cost of fertilizer is easily borne by larger grain production but it is not sustainable environmentally or socially, since it does not cover the cost of environmental damage or social costs. The organic agriculture focuses on “living soil”, on optimizing the use of biological processes and on avoiding the use of synthetic chemicals and fertilizers. An improved emphasis on conservation of soil, water, energy and biological resources, is defined as alternative agriculture. The normal agricultural practices using irrigation, chemical fertilizer, pesticides and high-yielding variety of seeds is called conventional agriculture. With increasing use of chemical fertilizers and pesticides the conventional agriculture is major source of pollution of inland water bodies and coastal seas. There has been growing criticism of conventional agriculture for its side effects, the “external costs” which impact communities, the environment, and human health. As for indicators of sustainability there is no single prescription. Sustainable practices will vary by cropping system, local environment and socio-economic system. Still, experience tells us that locally sustainable systems tend to be more resource conservative than less sustainable system and tend to rely less on external inputs and more on internal ecosystem services. The Indian government’s policies have always emphasized food grain self-sufficiency, which has not necessarily coincided with agricultural sustainability. The growth of agricultural production and productivity, which had risen significantly during 1970s and 1980s, declined during 1990s. These slowdowns have worsened since 2000, both overall agricultural production and food grains production have shown negative growth rates in 2000-01 to 2002-03 period. Decline in the growth rates of agricultural production and productivity is a serious issue considering the questions of food security, livelihood, and environment. As such, a critical examination of the approaches for sustainable agricultural development is necessary. This examination must be framed not only by India’s ongoing need to ensure food self-sufficiency but also by the consequences of access to international markets. Under the changing agricultural scenario, the agricultural technologies needs a shift from production oriented to profit oriented sustainable farming. In this direction, the pace of adoption of resource conserving technologies (RCTs) by the Indian farmers is satisfactory to a larger extent but, under the present scenario, we are in the half way of conservation agriculture. The CA systems will leads to sustainable farming and will be the most thrust of the future farming. The conditions for development of sustainable agriculture are becoming more and more favorable. New opportunities are opening the eyes of farmers, development workers, researchers and policy makers. They now see the potential and importance of these practices not only for their direct economic interest but also as the basis of further intensification and ecological sustainability. This does not mean that agrochemicals can be abandoned. Also, research has an important role to play. Bankers and funders should think of how best to provide incentives and credits, accessible to poor farmers and women, to make investment in dry land farming possible. As conditions for farming will continue to change, the key to sustainable agriculture is the capacity of farmers and all other actors in agricultural development, as well as the wider society, to learn, experiment, adapt and cooperate in an effective way. To conclude, a small farm management to improve productivity, profitability and sustainability of the farming system will go a long way to ensure the all round sustainability. Vyas V. S. (2003), India’s Agrarian Structure, Economic Policies and Sustainable Development, Academic Foundation Publishers, New Delhi. Puttaswamaiah. S. (2005), Sustainable Agriculture: An Exploratory Analysis of Two Approaches in India, Report under the Shastri Applied Research Programme, by Indo-Shastri Canadian Institute, New Delhi, at the Gujarat Institute of Development Research, Ahmedabad. AAFC (2003), Sustainable Development Strategy Sustainable Agriculture: Our Path Forward, Departmental Publication Services, Agriculture and Agri-Food Canada, Ottawa, Ontario, Canada. Kushwaha Niru (2003) Environment, Sustainable Development and Rural Poverty in India. Ph.D. Thesis, M.J.P. Rohilkhand University, Bareilly Ch. 4. The iPhone is none other but a compact mobile computer that provides not only telephone connectivity, but also continuous internet connection, data storage and a bottomless glass of technological entertainment. With the attractive applications available, nothing surprising to see immense iPhone Apps development to several countries, even now the less developed nation – India. The device can be a source of entertainment, platform dealers for business, channel for online networking and also to perform banking or billing tasks. The applications are the sole difference that makes iPhone differs from a typical notebook or laptop. It is now a highly profitable business if you are an application developer. The figure of iPhone users are rapidly increasing day and day and all they need are of course the applications to craft the device into their unique individual assistant or companion. Apple iPhone apps are in high demand everywhere, hence the smart decision of developing it into many countries. Besides, there are numerous entrepreneurs who shifted directions into developing applications as they see the potential and opportunities in the field. Basically these applications are invented by using analogous tools and general frameworks. Nevertheless, albeit the business is potentially lucrative, it is a costly trade due to the high employment salaries in developed nations as labors are getting more expensive. Primarily due to this reason, the iPhone Apps development has been moved to India to reduce the cost of the manufacture. Currently the potentials in India who develop and design applications are already on par with the western talents. But the massive transformation of location is because the salary of labor in India is so much lower, yet with equivalent quality hence Apple decided to proceed to this wise decision, making Indian applications gaining international admiration. The development of Apple iPhone apps comes under the province of software development and India is incessantly improving, producing world class software companies who receive reputable acknowledgement from foreign clients. From there, we can conclude that outsourcing the iPhone apps in India is indeed a right track to take considering the services are cost effective, interactive and totally reliable. In addition, foreign clients are pretty satisfied with Indian developers who show seamless virtue into the business deals, actively participating in the needs of customers and complying to their demands.